Indoor plants are a wonderful way to bring life into your home. Not only do plants add a beautiful design element, they can also create a more emotionally healthy home. A recent Dutch study found that hospital patients with plants in their rooms reported lower levels of stress than those without. Indoor plants also purify the air by removing toxins and increase oxygen in your home. Here is some general care advice as you bring a plant (or several) into your home. Extreme water temperatures can shock the plant. Water that’s too hot can cause root damage and can kill your plant. Water that’s too cold can cause dormancy. Soil that’s too dry or too wet will damage the roots of your plant and sometimes over or under-watering can kill a plant. The kind of leaf your plant has determines the amount of water it will need. Plants with lush, thick leaves (like a peace lily or fern) require more water than plants with waxy or leathery leaves like succulents and cacti. A good way to see if your plant is thirsty is by poking your finger into the soil up to your knuckle. If the soil feels damp, then you don’t need to water it. If it feels dry then you need to give it a drink. Drainage can help you with over and under watering issues so make sure there are drainage holes at the bottom of your pot. For indoor plants, selecting a pot with a saucer will help with overflow and prevent water damage on furniture surfaces. Materials like plastic, metal, and glass will absorb much less water than ceramic or clay, so keep this in mind when selecting pots. Cacti and succulents require special potting mix specifically designed to drain water efficiently. They also need pots with plenty of holes on the bottom which prevents too much moisture from being held in the soil, killing the plants. Plants need sunlight and the quality, duration, and intensity of light affect a plant’s growth. 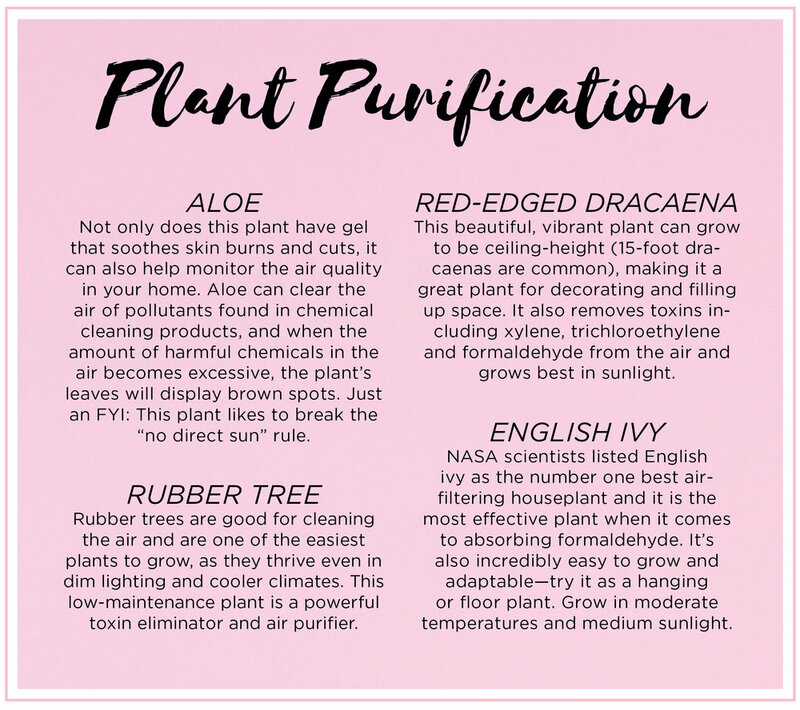 Avoid putting the plant in direct sunlight. Instead, give them plenty of indirect light by placing them in a well-lit room. Give flowering plants 12-16 hours of light per day and foliage plants 14-16 hours of light per day. Plants acclimate to their surroundings somewhat slowly, so it’s best you don’t move them around a lot. Take the time to decide where you want your plants to go and leave them there. Also, make sure you don’t pick an area of your home that sees a drastic change in temperature throughout the day. If you do want to move the plant, take it to the new area for an hour a day. Slowly increase the amount of time it’s left in the new area until it has fully adjusted. The first 10 stands for nitrogen, second for phosphorus, and the third for potassium. Houseplants will need help from you to get the right nutrients since they can’t pull them from their environment. While most houseplants will be fine with this balanced fertilizer mix, you can always tweak the nutrients for individual plants to get the most color and life out of them. If you have a flowering plant, you can buy a fertilizer that is high in potassium. If you have a foliage plant, you should get a fertilizer or potting soil high in nitrogen. A plant that isn’t pruned can grow out of control and will also outgrow its pot. Certain plants must have their roots pruned at different intervals, so it’s important to read up on how often you should be pruning your plant. Regular pruning also keeps your plant healthy, and to prevents you from having to replant. Make sure you are cutting off dead branches or stems that can attract bugs and always prune above the a leaf node at a 45° angle to promote growth of a fuller more robust plant. While some people claim that adding coffee grounds is good for plants, if you aren’t a seasoned plant pro doing this to plants with a low acidic tolerance can actually kill them. Also, putting coffee or tea into your potted plant can draw flies that can eat the plant’s leaves and the sugars in tea and coffee also make it a perfect breeding ground for these insects. There are so many great online resources that will give you detailed instructions on how to care for the plants you have chosen. You can also research beforehand to make sure you are getting the right kind of plant for your lifestyle. For example, succulents and cacti are great options for people who want a low maintenance plant. While they can be a little more work in the beginning as you get their soil composition and potting right, they don’t need to be watered as often as other plants. Most houseplants come with a tag that will have their common and scientific name which will be helpful as you research their care instructions. Many of the plants sold as houseplants do not really belong in an indoor environment. People unknowingly buy these species only to have them die quickly, discouraging them from buying another indoor plant. This is why it’s important to do a little research before you buy.